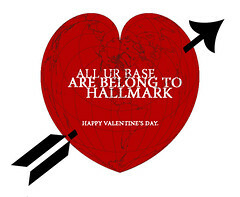 Here’s a valentine for you, my lovely internets. I’m going to pour some champagne on my keyboard now. Ready thy lusciousness. Eat, drink and be Gary. Oh, Gary. Here’s the Photoshop file if you’d like to make your own valentine. Found it! The map is from Paul Anderson’s map projections site.